The File CRC32 action enables you to automate the calculation of a file's CRC32. The action can also fail if the CRC differs from another file or a specified CRC32. The CRC is acronym for "Cyclic Redundancy Code" and 32 represent the length of checksum in bits. The "CRC" term is reserved for algorithms that are based on the "polynomial" division idea. The idea to compute the checksum is equal for all CRC algorithms: Take the data as a VERY long binary number and divide it by a constant divisor. If you do this with integer values you get a rest; this rest is the CRC checksum (for example 7 / 3 = 2 + rest 1 => 1 is the checksum of 8. CRC is a family of algorithms and CRC32 is one certain member of this family (other members are CRC16, XMODEM,...); CRC32 produces a checksum with a length of 32 Bit (= 4Byte). Filename - specify the file which you want to calculate the CRC32 for. Variable - specify the FinalBuilder variable to save the calculated file CRC32 to. 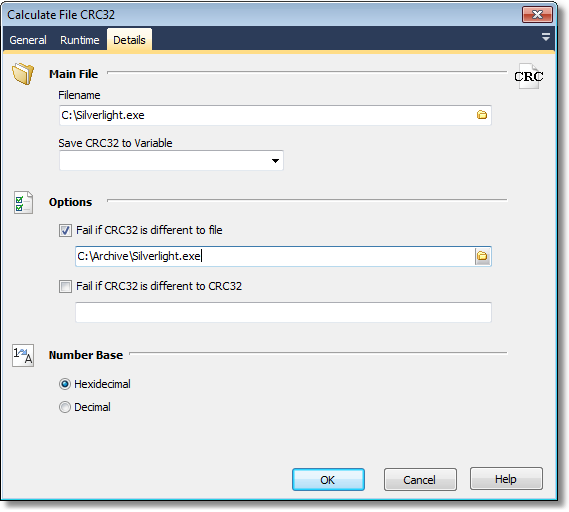 Fail if CRC32 is different to file - this calculates the CRC32 of the specified file and compares it against the CRC32 of the main file and fails the action if the two differ. Number Base - choose whether the CRC32 should be displayed/compared in hexadecimal or decimal format.